Tourmaline of different colors often form within the same crystal. These are can be quite varied in appearance. Occasionally heat treated to improve color. 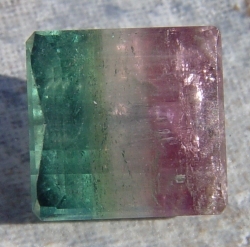 Bi-color Tourmaline is a member of the Tourmaline gemstone family. With a band of clear and bluish green.